"We're absolutely thrilled, after 143 years of frustration, to finally get the information we need about this star so that we can work out whether our theory of white dwarfs is actually correct." - Martin Barstow, Ph.D., Leicester Univ., U.K.
Hubble Space Telescope Wide Field and Planetary Camera image of Sirius A, the brightest star in our nighttime sky, along with its faint, tiny sun companion, Sirius B, in lower left quadrant. Image credit: NASA, ESA, STScl, U. Leicester, U. Arizona. December 17, 2005 Baltimore, Maryland - For the first time in human astronomical history, scientists have used NASA's Hubble Space Telescope to isolate the light from the white solar dwarf known as Sirius B orbiting its huge and bright companion, Sirius A, in the constellation Canis Major. 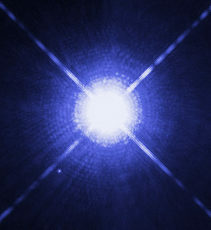 Since the Sirius B discovery in 1862, astronomers have been frustrated by the intense glow of Sirius A overwhelming their ability to "see" and "weigh" tiny, but very dense, Sirius B.